GE has stopped making the X5 camera as well as the rest of their camera line, but you may still come across them on the secondary markets. For the most part, we're not big fans of fixed lens cameras. Most are expensive, and, for just a few hundred more dollars, you could purchase a DSLR for vastly improved performance. So we were interested to have a chance to review the GE X5 camera, which offers a 15X zoom lens for less than $150 (if you shop around), something that's rare in a new camera. The X5 has some OK features, but its image quality is too inconsistent to give it a good recommendation for general photography. However, if you're going to shoot a lot of nature photos, and you need a long zoom at a really low price, the X5 is a good choice. When the shooting situation is perfect, the GE X5 creates photos with excellent image quality. However, when the shooting situation has some challenges, the X5 offers hit-and-miss results. This camera really struggles in low light when the flash is not in use or when you're trying to shoot with the zoom lens fully extended in low light. If you're inside the range of the flash, though -- 23 feet when the zoom lens is not extended and 13 feet when the zoom is extended -- the X5 works pretty well and creates nice-looking images. When shooting outdoors in good lighting, the GE X5 creates photos that are sharp and bright with realistic colors, as is the case with most low-priced cameras. The lens does a good job of focusing sharply most of the time, but when the zoom is extended, camera shake sometimes causes focus problems. Shutter lag is a serious problem with the GE X5, especially in low-light photos. Even in good lighting outdoors, though, you'll probably miss a few spontaneous photos or photos of moving subjects because of the X5's shutter lag. The X5 starts pretty fast, and it should be ready to shoot a little more than a second after you slide the power switch. GE's menu structure included with the X5 is pretty easy to use. As you turn the mode dial, a quick identification of the function you've chosen appears on the LCD. GE also included specific buttons for "smile detection" and image stabilization, which are handy. The camera's pop-up flash works pretty well, but its performance would've been much better if the X5 automatically opened the flash whenever the camera sensed it was needed, especially in fully automatic mode. You must manually activate the popup flash whenever you need to use it, which you may forget to do from time to time, which probably will result in poor-quality photos. The X5 is pretty easy to hold and use, but I noticed a few problems. First, the camera is a bit heavy because it uses four AA batteries. Being able to swap out AA batteries in a photography emergency is handy, but having to use four of them really adds too much to the weight of the camera. A rechargeable battery would've been preferable. Additionally, the camera just has a feel of being manufactured from inexpensive plastic. It just doesn't have a sturdy feel that you often have with fixed lens cameras. The lens cap GE included with the X5 was basically worthless, as it would not stay attached to the camera. 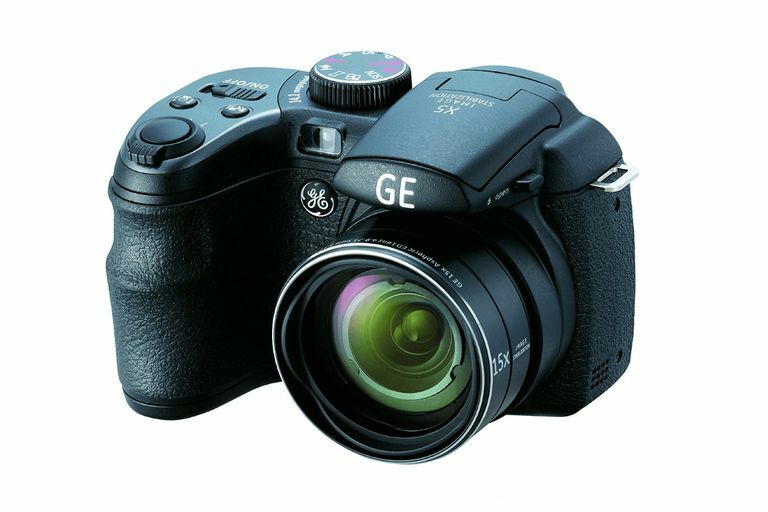 I did like the fact that GE included both an EVF and LCD with the X5. Very few sub-$150 cameras include a viewfinder anymore, so it's a great feature to have. You must press a button to switch between the two, though; both the EVF and LCD cannot be "on" at the same time. It would've been nice to have a larger LCD than the 2.7-inch screen GE included with the X5. It's also very difficult to see the LCD if you're holding the camera at an angle to your eyes, which makes shooting successfully at odd angles nearly impossible. What the GE X2600 Camera Like? Is the Nikon Coolpix L20 Worth It?